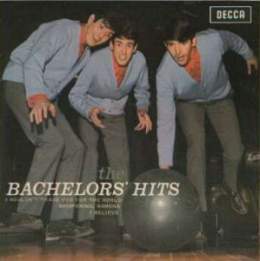 The Bachelors were not from the same rock and roll mould that cast most of the other groups of the early and mid-1960s. They began as a trio of harmonica players in Dublin calling themselves the Harmony Chords. Unlike almost every other group of the time they had no guitarist, but eventually concentrated on singing. They recast themselves as a folk group and changed their name to the 'Bachelors' (though all of them married early in life). Decca, who at about this time had turned down the Beatles, awarded them a recording contract despite (or because of) the fact that the Irish trio were a long way from other mainstream groups of the time. Their first release was a revival of the old song 'Charmaine'. Amazingly, this turned out to be a winning formula and the record reached the UK #6 position. Despite having difficulty with their immediate follow up to this success, a string of further hits followed. Their strident folkish vocals brought them a further seven top ten hits including 'Diane' which reached the #1 spot. They also took the honours in Britain with their cover of Simon and Garfunkel's 'Sounds Of Silence'. The EP featured on the right (DFE8595) is probably the most easy Bachelors release that can be found on that format. It simply contains some of the group's most successful numbers already available as the 'A' sides from their singles. The trio successfully maintained their popularity on the cabaret circuit for many years, doing so without change of personnel. Then in 1984 an embittered John Stokes split from the group in circumstances that led to a legal settlement and the subsequent creation of the 'New Bachelors'. However, John Stokes has since teamed up with Jonathan Young and former Karl Denver Trio guitarist Kevin Neill and they can be found together as a revitalised Bachelors.